This module is designed for any post-processing of dB-Lab results using SciLab expressions. Those expressions can be user-defined in the UI of this module. 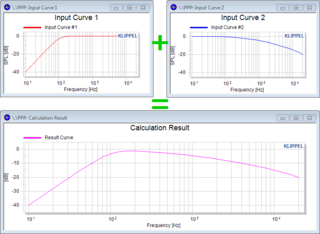 Up to 4 input curves and 2 single values may be used for the calculation and each of them can be either pasted manually or imported from another dB-Lab operation automatically. Additionally, the calculation results can be exported to other dB-Lab operations for changing their setup. This feature may be used to automatically adjust some operations according to the results of a previous operation. The Programmable Post-Processing (PPP) visualizes all results clearly within its result windows. The properties of all result curves and charts (e.g. curve names, colors or axis labels) can be adjusted independently. It is also possible to rearrange the different curves within the charts.